Ennis, Texas – The Texas Triple Tens will be held April 26th-28th, promoted by Cody Pollage and hosted by the Texas Motorplex. There will be a TNT on Thursday from 6 pm-10pm, and three main event races. Electronics racers will be running for $10k each day, while the bottom bulb drivers will be racing for $5k each day. 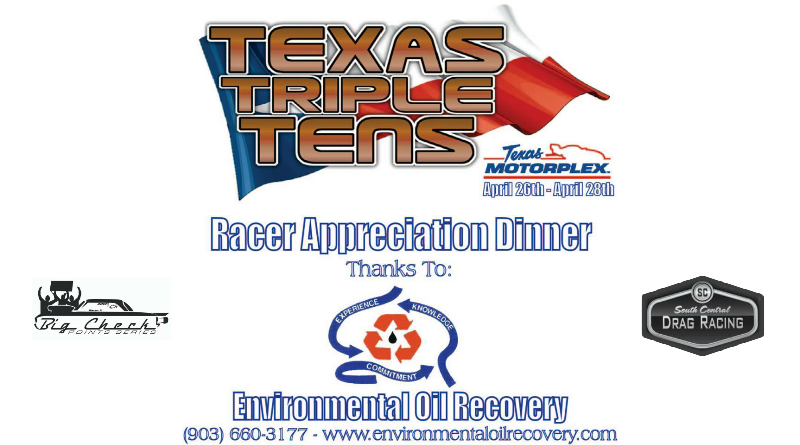 ​Troy Morgan, along with Environmental Oil Recovery have joined the Texas Triple Tens to present the Racer Appreciation Dinner April 27th. “We are very proud to have Troy Morgan and his company Environmental Oil Recovery come on board for this event. Troy is always looking for a way to help racers out and help them have a great experience,” Pollage said. “We are bringing back J’s Joint from Plaquemine, La to do the cooking and serving for this event again”. They are bringing in 1,500 pounds of crawfish, with all the toppings, such as corn, potatoes, sausage, etc. Check out Environmental Oil Recovery’s great services at www.environmentaloilrecovery.com or give them a call at 903-660-3177. About the Author: Paige Hamlin is the founder of South Central Drag Racing and Big Check Bracket Racing. Through her sites, Paige works to promote big money drag racing events. In addition to her media endeavors, Paige enjoys footbrake racing in her S-10 pickup.